Dynamite Entertainment has signed a deal with Djimon Hounsou is star in "Thulsa Doom," based on the fearless sorceror who was featured in the 1982 'Conan the Barbarian' movie and is a large character in both the Conan and Red Sonja comic books. The character will be featured in his own comic book published by Dynamite Forces next year and the movie has yet to be set up at any studio. Variety reported today that, "Planned pic will showcase the origins of the flawed hero and show how his road to hell was paved with good intentions." Djimon had said back in March he was planning a "dream comic book trilogy." Rumors then swirled he was reffering to Tin-Tin or perhaps rumored Black Panther, but in the audio bite, you clearly hear "Conan." The rumors can now cease and it is clear he was reffering to Thulsa Doom. Robert Rodriquez is also working with Dynamite Entertainment to bring Red Sonja to the screen again. Rodriquez has his ex-girlfirend, Rose McGowan, scheduled to star as the lead and the two have a panel at Comic Con this week. Robert Rodriquez will be producing the film, while Douglas Aarniokoski will direct for Nu Image and Millennium Films. Rumors can begin swirling if Djimon will play "Doom" in Red Sonja also! Thulsa Doom can also setup the new Conan series as well, because Doom once trained Conan. 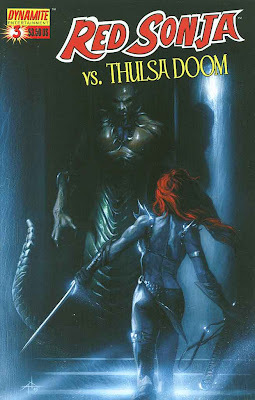 What are your thoughts on Thulsa Doom & Red Sonja? Will you see either? Does Rose McGowan work as Red Sonja? 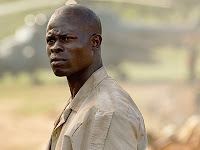 Djimon as Doom impress you? Have you ever seen the original 1982 film with James Earl Jones as Doom?